There is nothing I love more in this world than a proper portal fantasy book. They are my favorite type of fantasy novel (second only to clever, charming thieves) and they are increasingly hard to find. A portal fantasy is a book that features a secondary world that the protagonist finds either by accident or serendipity. Books of this genre include Alice In Wonderland, Neverwhere and now Wicked As They Come, the best book I've had the pleasure to read this year. Wicked As The Come is a dark, lush fantasy that has everything I could ever want. It is, without a doubt, the best portal fantasy I've read in a very long time. Deliliah S Dawson does an incredible job of catapulting you into this amazing world she's created. It's called Sang and it's a dark, askew Victorian steampunk world and it is just brimming with awesome. It's a very visceral world and her descriptions of it's quirks and inhabitants were pitch perfect. Does Sang have a Board of Tourism? I want to visit. Badly. 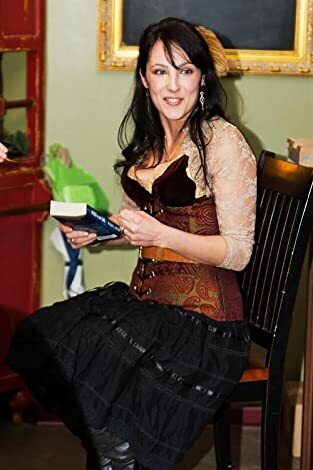 The leading lady of this story is Letitia (Tish) Paisley Everett, a nurse trying to claw back some of her identity after a relationship goes bad. She happens upon a golden locket at an estate sale and leaves with it, drawn to it's beauty. When she pries it open, she's splashed with a red liquid that stains her skin. Next thing you know, she shows up naked in Sang, with the darkly handsome Criminy Stain there. Criminy is a lot of things, but first and foremost, he is a Bludman. A Bludman is a type of blood drinker, either born that way or changed later in life. They're hated by the rest of the population, fondly called Pinkies, and marginalized and abused. Sang has gone full blood drinker, with even the rabbits out for your delicious coppery blood. The human population is kept in crammed, dirty cities and cover themselves up in the most Victorian of clothing. Be still my heart. Forget visiting, can I become a citizen? Criminy is the ring leader (literally) of a traveling circus and freak show and he takes Tish back with him. There's instant attraction between Tish and Criminy which was fascinating to read. She meets others in the circus and is convinced to become part of the show. On top of this perfectly steampunk dystopia, to drop us into a circus is just genius. I wish there was a novel for every character there, each one was interesting in their own right and fully realized. Breathtaking. Tish discovers that Criminy bespelled the locket a long time ago to bring him his true love. He fully believes it but allows Tish to come around to the idea on her own. He's a gentleman as well as a rapscallion and he lights up every page he's on. He helps Tish navigate through the wonderfully demented world of Sang as they uncover a vast conspiracy and have to go on a quest to recover the locket, stolen while Tish slept. Wicked As They Come is an electric tale, both parts fantastical adventure novel as well as a romance. I could not put it down. Every time I opened the book, I was instantly transported to Sang. It was so real I could almost smell it. Portal fantasies are amazing like that. They admit that our world exists, but also shows you another world where adventure and romance await you, if only you can find the right gewgaw to unlock it, or are in the right place at the right time. I don't have to tell you how long I've been waiting for a white rabbit in a waist coat to run across my path. Now I'm going to be looking in every antique locket I find for a painting of a devilishly debonair Bludman! Dawson has created something very special with her book and I am chomping at the bit like a bludmare to read more! There is an additional e-novella out right now, called The Mysterious Madam Morpho, that also takes place in Sang. 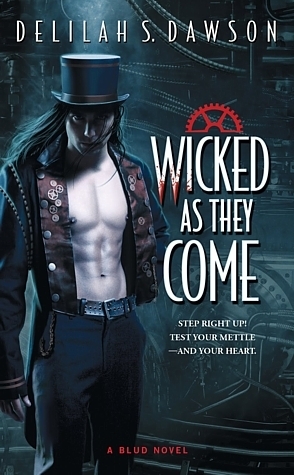 The sequel to Wicked As They Come, called Wicked As She Wants, arrives in April. Which is far too long away for my liking! The 2nd Blud novel, out in April! I implore you to pick up Wicked As They Come immediately! It has everything you could possibly want. There is adventure, romance, humor and blood sucking bunnies! Who doesn't love a good blood sucking bunny? All this and more wrapped up in a beautifully twisted and alluring steampunk dystopia. Trust me, you want to read this book. You need to read this book. Don't make me sic a bludbunny on you. Those furballs are vicious! Oooo I am going to have to put this on my TBR for sure! !